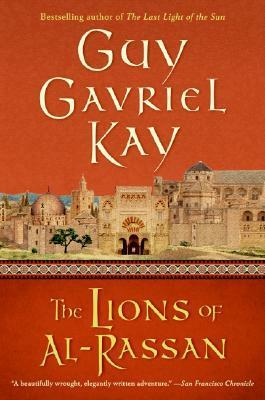 It will come as no surprise that I loved today’s book, The Lions of Al-Rassan by Guy Gavriel Kay. We at Quill consider Kay to be one of the best authors currently in the fantasy and science-fiction scene, and when we read one of his books it is less a question of “is it good”, and more a question of “how good is it?” To immediately answer that question, the answer is: really, really, good. The Lions of Al-Rassan is a masterpiece that everyone should read and just barely loses out to Sailing to Sarantium as my favorite Kay book of all time. Lions is ostensibly a historical fiction based on the civil wars, and eventual unification, of Spain. I think. I am not a historian, so my knowledge of this time period and the metaphors that Kay uses are not the best. Regardless, the book tells the story of a country divided by kings (lions). Kings are everywhere, popping up one after another, and each claims to be the true heir and inheritor to the land around them. On top of this, there is a panoply of warring religions in the region that are all vying for dominance in the form of religious genocide. As you might guess, these conditions make for extremely turbulent, dangerous, and fluid times where power structures and the hierarchies of nations are changing constantly. In the midst of all of this, our story follows four “advisors” to various kings and gives a poetic dissertation on loyalty and the difficulties of being a good person, and doing the right thing, in nebulous times.
) in Al-Rassan. However, he has had to do many terrible things for his lieges and is finding it harder to be true to himself. Then we have Rodrigo, Ammar’s counterpart in a rival faction. Rodrigo is a charismatic leader, beloved by his men, and possibly the single best fighter in the entire country. He and his band of 150 horsemen of Jad struggle with being true to their kingdom, and its zealous religious faith, while internally struggling with some of the doctrines and beliefs of their land. Finally, we have Alivar – one of Rodrigo’s aforementioned 150 horsemen – who is young, naive, and trying to make his way in the world. Through Alivar’s eyes we witness a young man who has a talent for war, but a mind that desires peace. The characters in Lions are frankly phenomenal. I deeply love every single one and Kay shattered my heart at least five times over the course of the book. The story is just beautiful and feels like it speaks to good people trying to be good in situations where there are no good options. I found Lions asking me to think about smart questions I had never considered before, such as “what do we owe our children?”, and found it to be a very thought-provoking and contemplative book. It helped me grow a little as a person, which is, in my opinion, the single greatest trait a book can have. It also did this while showing me a positively fabulous time. On top of the characters being genuine joys to be around, the book is funny and fun when it is not being sad. The dialogue is witty, and the situations characters find themselves in can be hilarious and heartwarming. To top it all off, the book is a standalone and ends with an incredible climax that feels both thematically satisfying and gripping to read. There is absolutely nothing imperfect about The Lions of Al-Rassan. The pages of this thoughtful story are poetry for the heart and this book would easily place in my top 100 of all time. The characters are eternally memorable, the prose is top-in-class, and the story is engrossing from beginning to end. The Lions of Al-Rassan is a masterpiece of fiction and a book that should be on every person’s must-read list. Reviewing a Guy Gavriel Kay book is a tricky thing. The reason for this is when I review a Kay book, I am not assessing whether or not it is good, but more how it stands in comparison to the rest of his work. If you want to know if Children of Earth and Sky is worth reading, the answer is yes it is. I firmly believe that Kay has never written a book that isn’t worth reading, and this will probably hold true for all his work to come. But how does Children of Earth and Sky stack up to works such as Tigana, Under Heaven, and Sailing to Sarantium? Read on and find out. Children of Earth and Sky is a story set in the same universe as the Sailing to Sarantium duology, but after an enormous amount of time has passed. The story takes place after Sarantium’s fall to a horde of conquerors (presumably representing Attila the Hun and his conquest of Constantinople). The book follows five main points of view, and a few minor ones, of spies hailing from different city states as they all conduct spycraft for their countries in different ways. There is a painter, a nun, a merchant, and two warriors who all pursue different agendas for different parties. What I found most interesting is that Children of Earth and Sky focuses much more on the individual POV’s than the political parties behind them. While Kay always tells the story of the person not the people, this story seemed to focus more than usual on the lives of the characters more than greater happenings in their nations. The first thing I will say about Children is that it had the fastest introduction out of any Kay novel I have read. It usually takes a while for me to fully immerse myself in a Kay novel, but with Children is was easy to dive right in and feel invested in the various point-of-views. Each of the characters is someone undergoing massive change in their lives and thinking about their future, and I cannot imagine a reader not being able to relate deeply to at least one of them. The writing, as always with Kay, is absolutely gorgeous with some of the best prose around. I also think this is one of Kay’s most fast-paced books (which is like saying you have found a particularly fast turtle). With so many POVs, you tend to get bounced around from one exciting event to another. Despite the numerous POVs, I felt that each individual character got a very full and fleshed out story. However, due to the number of POVs, transitions can sometimes be very jarring and confusing. I said there were five major perspectives, but honestly there were more like eight as we spend a lot of time in the minds of the leaders of city states in the story. In the end I do not think this plethora of characters detracted from the storytelling, but it did slow down the pace of the book considerably. On the other hand, this slower pacing allows you to really get the feel for the characters and come to know them. One thing I did not like was the enormous amount of nods to Sarantium in the novel. I was looking forward to a few references but the sheer quantity was overwhelming. By the end, I felt like you would have had to read Sailing to Sarantium and The Lord Emperor to fully appreciate Children of Earth and Sky. Like all Kay books, it has taken me a long time after completion to understand how I felt about it. Children did not excite and thrill me, inspiring me to read in every second of spare time. Instead, Children is a slow and contemplative piece of work that will make you think about many of its scenes and ideas long after you complete it. On this note, I feel as though the messages in Children of Earth and Sky are much more subtle and quietly spoken than Kay’s other books. This is a book that I think could be read several times and you would find more hidden in its pages every time. While I do not think this is Kay’s best novel, I certainly think it is in his top five and is a book anyone can enjoy. Tigana, by Guy Gavriel Kay, generated by far the most conversation of any book we have read so far. As opposed to previous contested books we have had in book club, Tigana had less of a spectrum of different opinions, and more of a splitting into two camps: people who loved it and people who hated it. On a scale of 1-10, half of the group had scores of nine or above and the other half of the group had scores below 5. The final resulting average for the group was a solid seven, however it was the first instance where no one seemed happy with the score as all felt it should be higher or lower. I will attempt to dissect the various sides of the argument below, but before I begin I’ll add a small disclaimer: myself and all three editors for this blog all fell into the 9+ camp and are likely biased as we break down the discussion. Tigana is a historical fantasy that takes place in a setting similar to medieval Italy, and follows the story of a country called The Palm. The Palm has been invaded and split by two great sorcerers from different empires, with all the land being occupied by one or another, barring a single province remaining contested between the two. However, the majority of the plot revolves around one of the already conquered provinces, Tigana, and we follow the point of views of a variety of Tigana citizens as they attempt to free their province from one (or both) of the sorcerers. The book reminded many of a Shakespearean tragedy that focuses on the question, “what is the price of culture”? The characters of the story are varied in background and personality, and we are treated to a diverse set of opinions on the value of life and culture. The execution of these ideas is where the group heavily disagreed. Team Pro-Tigana: Those of us who loved Tigana found the book to be a work of art. 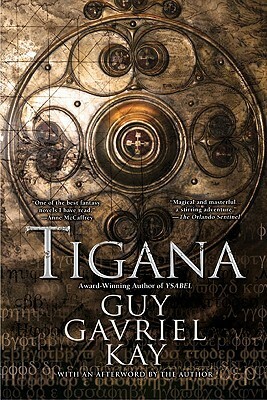 Guy Gavriel Kay was on my masters of prose list for a reason, and the writing in Tigana was flowing, poetic, and emotionally impactful on a number of levels. The characters were extremely deep and represented a large number of perspectives for the reader to easily identify with and life through the various sides of the conflict. The various agents in the book felt like real people who we knew, or represented ourselves. The book has a cleverness that we loved, and uses every set of characters in a pair as foils for one another. The characters helped pull us into the book, and multiple people found themselves thinking about their own life and decisions as they read it. The story also just broke our heart over, and over. It is not a book for those looking for something happy and uplifting, and some of the characters in Tigana are among the most tragic we have ever read. Tigana is a magical piece of literature that transported us into its world, evoked deep thought and consideration on difficult topics, and created strong personal connections between the reader and the characters. We collectively cried enough to fill a bucket and highly recommend Tigana. Team Anti-Tigana: Those of us who hated Tigana frustrate me deeply, but had the following complaints. Many considered the book to be first and foremost incredibly boring. Multiple people claimed they felt absolutely no connection with any of the characters, and found them unpleasant to follow through the story. Without the connection to the characters, the “con” group found the plot slow and incredibly dull. Some found the pacing jarring as the perspective often jumps from point-of-view to point-of-view to tell the story. It was said that this broke all momentum in the story and it felt like any building excitement was lost. A few of the “con” group also claimed that they found the writing pretentious and that they preferred more austere prose. While most finished the book, and understood conceptually why many of us liked it, the “con” group vehemently does not recommend Tigana. Despite creating such a large disagreement, Tigana was for me an incredible study on how readers can read the same book and have such a vastly different experience. Where one sees a character that they can pour themselves into and sympathize with going through a tragic and moving trial, another sees a grating and unrelatable cut out who slogs through a boring story. Regardless of how much people enjoyed the book, I highly recommend Tigana as a book club book as it generated some of the best conversation we ever had. Patrick Rothfuss – Let’s start with Rothfuss himself as a introduction. Patrick Rothfuss is almost as much a poet as author, and the fact that his character is also poetically inclined only enhances this fact. Rothfuss’s prose feels both beautiful and accessible, which is what makes it such a powerhouse. He describes scenes in vivid detail, but only focuses on the important and does not waste time on the frivolous. With his honed writing and clever direction Rothfuss piques your curiosity and then paints your imagination without a single word wasted. The combination of both beauty and clarity is what makes him so good. Neil Gaiman – Gaiman’s writing always reminds me of Grimm’s Fairy Tales; serious and dark subjects surrounded in whimsy and mystery. There are few authors with prose as imaginative and fun as Neil with his fanciful descriptions and mysterious and silly conversations. Yet these words still pack a punch, with layers of meaning and philosophy built into every single paragraph. Every single time you reread a work of Gaiman’s you will find some new meaning you didn’t see before and find the words more captivating than you remember. He is a thoughtful writer who has induced endless conversations about the complex meanings of stories. Scott Lynch – Lynch has the one of strongest voices I have ever read. When you read any of his books you become the characters he creates, and live their lives. His books are both hilarious and alive. I don’t have a favorite part of any of his novels because if you were to open to any single page and start reading you would find yourself smiling and laughing. His books read like your best friend making you laugh after a rough break up and continue to bring me comfort whenever I need them. His prose will make its way to your heart and warm it with his lovable rogues and perfect humor. I have only found one or two books even close to as dripping with humor as Lynch’s work. Robert Bennett – I have only read one of Bennett’s books, City of Stairs, but it was enough. Bennett has displayed a talent for action, description, and imagination in his prose. His prose has both vivid detail, and an edge of humor, that makes scenes and descriptions both clear, beautiful, and memorable. In addition, in the creation of his original creatures and places he demonstrates a clear talent in helping the reader see his own imagination with clarity and understanding. His outrageous descriptives, dark humor, and use of the present tense in City of Stairs made me feel like I was reading something one of a kind. Joe Abercrombie – Next we have the king of combat and the Escher of the fantasy world, Joe Abercrombie. I think that many in the fantasy world would agree that Abercrombie is one of the, if not the, most clever writers in the genre. There is so much going on in his prose that multiple people can read it, discuss it after, and wonder if they read the same story. Abercrombie’s prose feels like reality instead of a story, and does wonders bringing his tales to life. In addition, there are only a few authors who can write combat prose as well as Abercrombie. Many books feel like people just waving swords, but with Abercrombie you can feelevery sword blow, run every footstep, and take every breathe alongside the warriors in every battle. Terry Pratchett – The world lost a giant when Terry Pratchett passed away last year. I honestly do not feel like I am a good enough writer to describe the power of Terry Pratchett’s prose, so instead for once I am going to refer you to the words of someone else on this list, Scott Lynch, as he describes what it was like to wake up in a world without Terry Pratchett (Warning – It will make you cry). Ursula K. Le Guin – Le Guin’s prose is very, very powerful. She writes the kind of novels that make you feel bad about the way you live your life, and cause you to vow to give more to charity. Her prose uses tone and flow masterfully to manipulate your emotions and makes her messages incredibly heavy hitting. She is one of the few authors I have read to move me with just short stories like this one (only four pages long). Her work hits you like a truck full of bricks and is a great choice for someone looking for moving prose. Gene Wolfe – Gene Wolfe writes the most dense, elusive prose I have probably ever read. His works are not on the same continent as “easy reads”. However, while his work requires a huge investment of time and patience, even the smallest snippet of his prose is enjoyable and oversaturated with meaning. You can read a book like Shadow of the Torturer 30 times and still find that each chunk of prose has new secrets that you did not find before. People are still writing books about the depth of his prose 30 years after it was published, so if you are looking for someone who meticulously chooses each word in a sentence/page/chapter/book he is always worth a read. 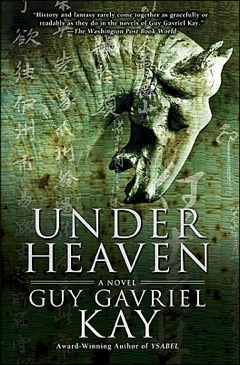 Guy Gavriel Kay – Kay writes mostly standalones, and his release times are infrequent. However, the long waits are always worth it as Kay’s prose will make you feel like you are living in another world or era. Kay is the most transportive writer I have ever read. He spends years studying the cultures and places he writes about so that he can get the details just right. His prose, without fail, takes you on journeys and fully immerses you in the characters lives until they feel like your own. His writing style is also incredibly poetic but also not too dense. This combination creates passages that are deeply moving but don’t require hours of thought to decipher their meaning. If you want to go on a journey, give any of his books a shot. J. R. R. Tolkien – Tolkien. I feel like I really don’t need to justify why Tolkien is on this list, as Lord of the Rings is accepted as literature by a lot of people. However, I will say this – The Lord of the Rings is the kind of book that everyone wants to say they read, but doesn’t want to actually read. Its combination of popularity and dense prose encourage lots of people to skim through them in order to simple claim they have read it. This is a huge shame, because the prose (and everything) in Lord of the Rings is incredible. Tolkien’s prose is poetically descriptive, deeply laden with metaphors and symbolism, grand and inspiring in scope, and often times surprisingly funny and light hearted all at the same time. There is a reason he will forever be considered one of the all time fantasy masters, if you haven’t take some time and read through his books some time. I am a sucker for huge sweeping stories. Two of my all time favorite series are The Black Company and Malazan. At about 10 books each, they are masterpieces of world building, plot intricacies, and character development. But they are not good because they are long; they are good despite being overly long. One of the largest criticisms in Sci-fi and (in particular) Fantasy is that books often are just unnecessarily long and that authors waste too much time filling space when they could have had a much better book had it been shortened to a smaller installment. While there are a large number of fantastic trilogies and series, there are a number of standalones that show that an incredible story can still be accomplished in a much smaller package. Any of the books below are worth checking out and will take you a fraction of the time of a larger series. 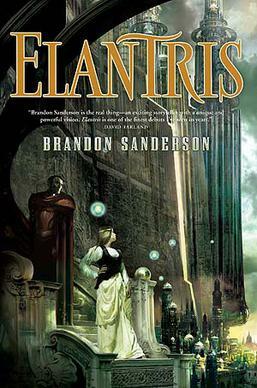 Elantris by Brandon Sanderson – There were once divine beings in the city of Elantris, god like entities that could accomplish anything. However, one day the city fell and took its inhabitants with it. Elantris is the story of a paradise turned hell. The glowing divine city suddenly became corrupt and now instead of divine powers it’s inhabitants are granted cursed immortality. They cannot die, but nor do they heal. Any damage done to the body stays, along with the pain. The citizens of Elantris now slowly go insane due to the unrelenting pain they are forced to endure. Occasionally random outsiders will be “blessed” with ascension into the new city. However, with the city’s fall from glory, the blessing has become a death sentence. The story of Elantris follows a few different characters, but most importantly it shows the story of a newly risen Elantrian named Raoden and the start of his life in the disgraced city. Raoden’s attempts to survive in, and solve the mysteries of, Elantris are fascinating. In addition, the other characters provide a lovely political backdrop to support Raoden’s story and flesh out the creative world. It is a story of tenacity, mystery, and creativity that will have you hooked from page one. 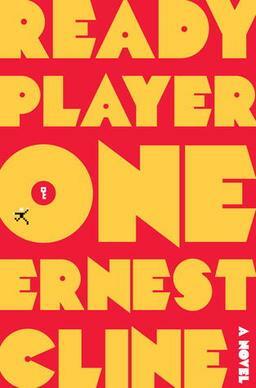 Ready Player One by Ernest Cline – The future is crap and we ruined the world, but there is still Facebook and World of Warcraft, so who cares? In a post apocalyptic future, humanity has ruined the world but created the ultimate coping mechanism: Oasis. Oasis is part virtual reality, part social media, and part game. It is a tool designed to help people cope with the wasteland that has become their world and provide an escape. The popularity of Oasis has made its creator the richest man in the world – and on his death he left his entire inheritance to whoever can find it hidden inside Oasis. The story is about the greatest scavenger hunt of all time and a boy who wants it more than anyone. If you have a sense of adventure, like retro videogames, or are looking for something uplifting then this is a good for you. The book is extremely exciting and fun and has a sense of glee that regardless of age will sweep you along for a ride. The scavenger hunt is also in the form of a variety of retro games, so if you are both a reader and a gamer this book with hit a sweetspot. 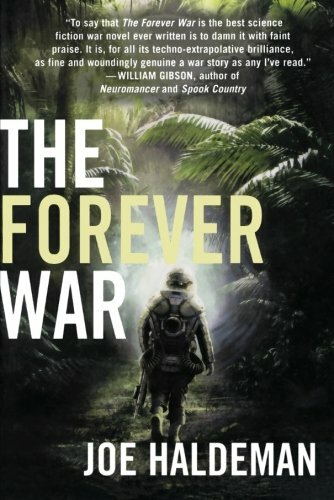 The Forever War/Armor by Joe Haldeman/John Steakley – First off I am aware there is a sequel to The Forever War, you can pretend it doesn’t exist. These two books by different authors both speak on the same idea: the horror that is war. Both books are about a humanity who has made it to space and is basking in its newfound intergalactic glory. Both books show a humanity that starts space wars for bad reasons (a commentary on the Vietnam War). While both books cover almost all the same aspects of war, they have slightly different focuses. The Forever War chooses to focus on the pointlessness of war. In this story the combatants are sent light years away from home to fight a war on distant front lines. The problem is that the travel time takes so long that by the time they arrive, the war has changed. The soldiers sign-up, and leave their homes and families who will be long dead and gone by the time they get back. Both the books do a great job of giving you the helplessness of a soldier. In Forever War, the time skips between war fronts are constantly giving soldiers the feeling that despite the horrors they experienced they have accomplished nothing in the long run. On the other hand Armor chooses to focus on the psychological destruction of soldiers who are trapped on hellish foreign battlefields. Soldiers in this war are wrapped in powerful war machines called armor to help them survive. The armor keeps the soldiers alive in hostile terrain, boosts their combat ability, and most importantly doesn’t let them quit. Armor shows the wear-and-tear on the emotional state of soldiers as they are forced to repeatedly go into combat that they can tell is wrong on a variety of levels, but never quit. The strain on the mind is vividly described and makes you question the worth of the horrors soldiers experience. 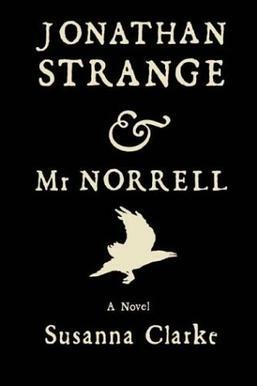 Jonathan Strange and Mr. Norrell by Susanna Clarke – Disclaimer, this book is about as standalone as the original Lord of the Rings book is (it was originally sold as 1 novel). The book is huge, but it is both technically standalone and fantastic so I feel the need to bring it up. Jonathan Strange and Mr. Norrell is a historical fiction set in England during the Napoleonic wars. The story follows two English gentlemen in an age where magic is dead. Once long ago, magic was freely practiced as a pastime, but overtime died off until it ceases to exist. Norrell is the world’s last practicing magician and Strange is the first new magician to enter the world in ages. The story follows them as they work both together and individually to return magic to England and to win the war against Napoleon. This is a weird book to recommend because for some it will be their favorite book, and for others it will be “not their thing”. However, either way the book accomplishes some pretty daring things. For starters the setting, prose, and history is very well done and beautiful to read but the big draw to this book is it is written as an actual history book. By this I mean, the book has footnotes out the wazoo referring to fake other texts, it has citations from fake historical magicians in the world, and it is written in the historical narrative perspective. As someone who just spent a lot of time in graduate school it was incredible to see a book that so well mimicked an academic text in fantasy form and really pumped up my enjoyment of the book. For others, they will read it and have no idea why this style is so appealing to weirdos like me. Any Standalone by Guy Gavriel Kay – Guy Gavriel Kay has a variety of plots amongst his plethora of standalone novels, but they all have a similar overarching feel: far eastern fantasy with a hard hitting emotional journey. Guy Gavriel Kay wins the author award for getting me to cry in the shortest period of time in a book. I feel like an apt comparison is his books feel like the move Up by Pixer: utterly heartbreaking but incredibly uplifting at the same time. The books take on a slower and more dramatic pace, but the amount they accomplish in their short stories is nothing short of extraordinary.